How do you help a kid find something to write about a poem? How do you dig into a poem yourself, especially one you don’t “get”? And how do you find the beauty in densely poetic scripture texts? I use the same method for all three needs. It’s basically the method I taught to college students in introductory literature classes under the name “close reading.” And it’s also very close to the “inductive Bible study” method I learned in my college fellowship. So whichever you want to call it, and whichever you use it for, I’ll describe what I do, and give you a free printable reference card. What would it be like to be in this scene? What would the author most want me to remember? Are there opposites or contrasts? What does the passage sound like? How does it flow, where are shifts? What are the repeated elements supposed to make me feel or know? How does the flow of the poem reinforce/change the meaning? How would I divide this poem into sections? What is the form of this poem? (e.g. sonnet, psalm) How is that form usually used? How would this poem have been received originally? (oral presentation, handwritten manuscript, published in a magazine, sung) How does my knowledge of the presentation or audience affect the meaning of the passage? Are there obviously “loaded” terms for which I need some cultural context? Do I agree or disagree with the poet? Has it changed me in any way? Do I want to change my life in any way in response? So, those are my five steps. 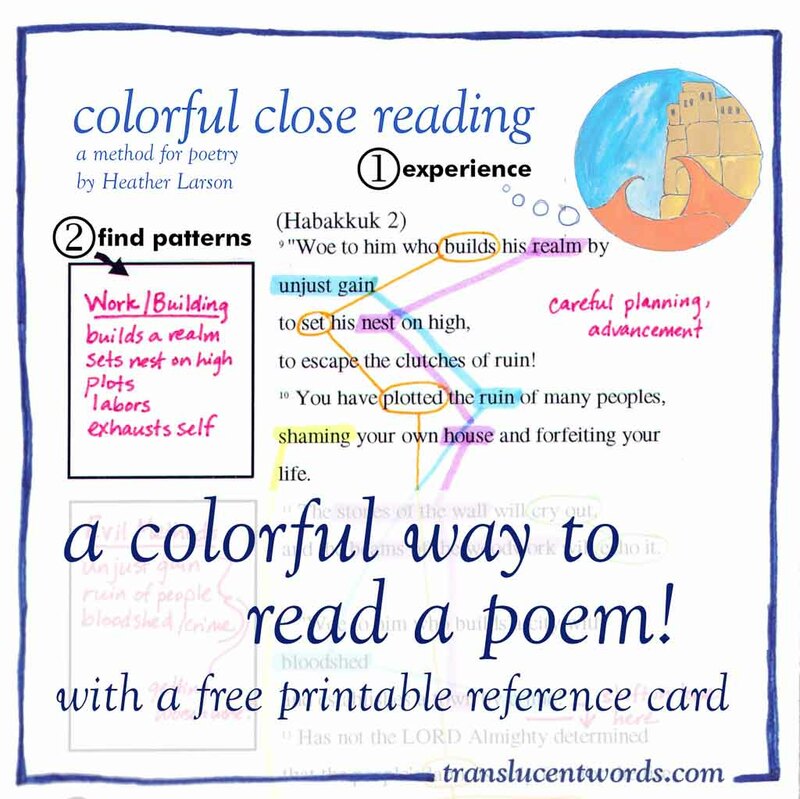 Be sure to download the free printable prompt card: ColorfulCloseReading. …and to let me know if you have ideas to add to my list!